I've sort of mentioned this a couple times, but I thought I'd put together a post to focus on the topic. The Cadette troop that I help lead decided last year they wanted to do one "badge meeting" and one "service meeting" each month. The girls really want to earn those President Volunteer Service Hours and they want to earn hours for Hearts of Service, which a program our Service Unit provides. They have hearts of gold and enjoy helping others. Each month, we have two meetings. One is almost 3 hours long and is focused on a badge, fieldtrip, or activity of some sort. The other is about 1 1/2 hours long and we do various service projects. At the beginning of this year, we sat down with the girls and had them brainstorm about the service projects for the year. We did this in junction with planning the badges. It was much easier this year, because we had a list to start with. 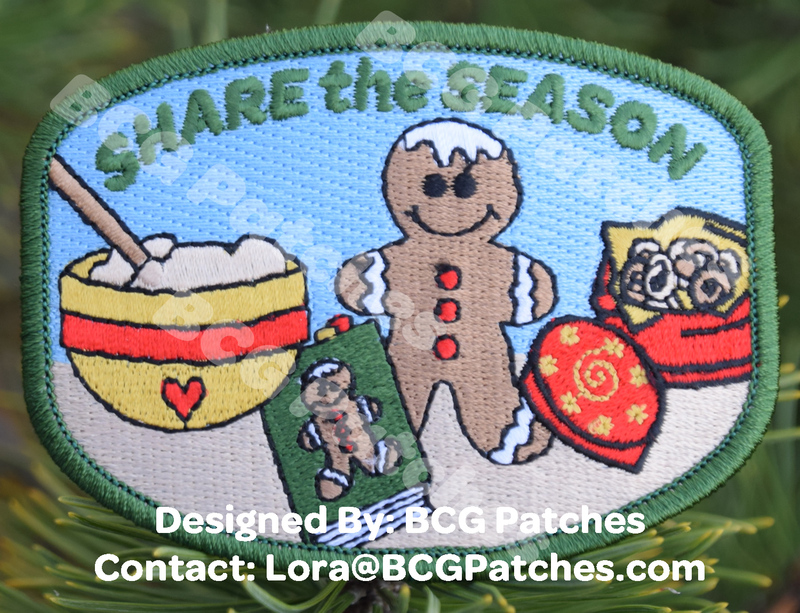 BCG Patches has the Helping Hands patch program and we used that when we ran out of ideas on who to help. September we made cards for a dear friend's Mom. October we'll be making treat bags for the teachers at the girls' school. I know when the girl's were younger badges were where it was at, but as they grow sometimes they don't have the same desire to earn badges about food or financial literacy. Girl Scouts, as you know, is girl-led. Allow them to change their meeting structure to fit their passions. That may mean a service meeting, such as ours. It may mean a "dinner and movie" meeting or something that is not the traditional meeting plan when we think of a troop meeting. But, that's okay. Keep them interested. Keep them coming back. Be flexible and roll with their ideas. I have been excited about this Patch Program launch for 3 months!!! Ever since I received the proof of the embroidered patch and saw the amazing detail, I've been wishing my days away. Crazy, I know.. but LOOK at this patch!! 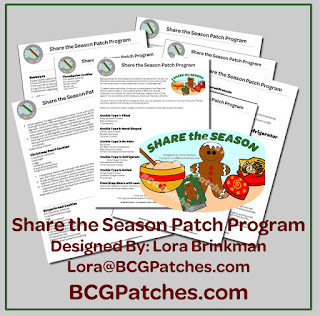 The Share the Season Patch Program is the October 2016 release from BCG Patches (my little patch company). It's all about the tradition of holiday baking and sharing those labors of love with those you love or those that could use a little happiness. To earn the patch, you are asked to bake 5 different types of cookies and treats. You can do it all on one big baking day or you can divide it up over several different days. That's up to you. The only other requirement is to share the goodies. Each year, I bake 10-12 different types of cookies and treats, then load up about 20-25 tins with all the goodies. My husband and I deliver them to friends, family, business associates, and the various people in our world. This is the 10th anniversary of that tradition. So, it's just appropriate that I share that tradition through a patch program. 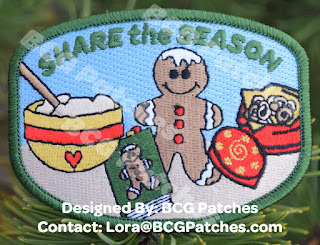 This is not the only winter fun patch coming from BCG Patches, either. November will knock your socks off. I earn patches, so can you! Little known fact.... maybe not.... leaders love earning patches, too. Well, at least I do. This week I'm attending the ColdFusion 2016 Summit in Las Vegas. You know I'm a computer programmer to pay the bills right? I know, poor me. Vegas for 5 days for work. Anyway, my husband came with me and we took a little drive to Red Rock Canyon. It's awesome! It's definitely different natural elements than mid-Missouri. So, I worked a little on Go Wild and Explore Earth. I want those patches on my blanket, so I need to get them earned. This post has no other point than to give you full permission to earn patches with or without your group. Patch programs challenge and continue your learning. They cultivate your creativity. That's good for your brain and psychological well-being. Never stop learning. How many of us have problems saying "no"? Pick me! Pick me! I wish I would have figured out the tricks I just learned this morning when I was baking 250 cupcakes for a Girl Scout event. Yeah... 250 cupcakes... iced... all cute like. Do the math, people. That's 11 cake mixes! My problem is was that I have 5 pans for cupcakes (remember, 11 mixes and that means 22 pans). I have 4 twelve cupcake holder pans and 2 six cupcake holder pans. When cupcakes come out of the oven, they are hot little buggars and I needed to go again. I'm not a patient baker. When you try to grab those little suckers out of the pans, you burn your fingers. Yes, you could use a hot pad, but then you tear up the cupcake. You can try to pinch on the sides, but then you know you are going to loosen the liner off the cake. Cupcakes are delicate! Especially when you want them out of the blasted pan for the next round of batter. 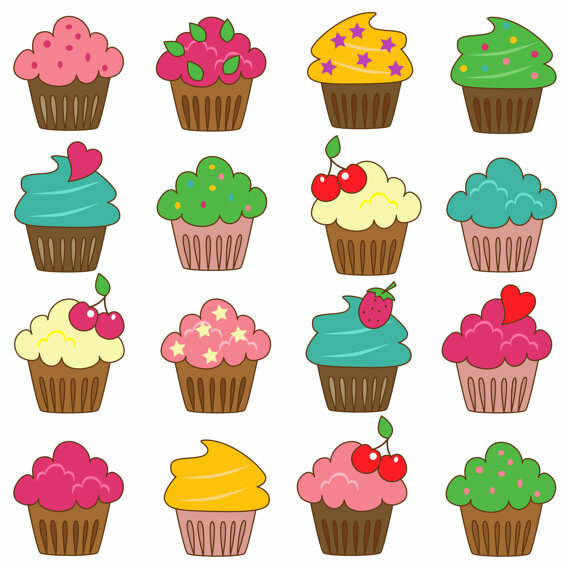 This morning, I was baking some cupcakes and thought "hmmmm... I wonder...." I have cooling racks that I use to flip sheetcakes out of pans. you put a cooling rack over top of the pan, flip, and voila. Sheetcake on cooling rack. 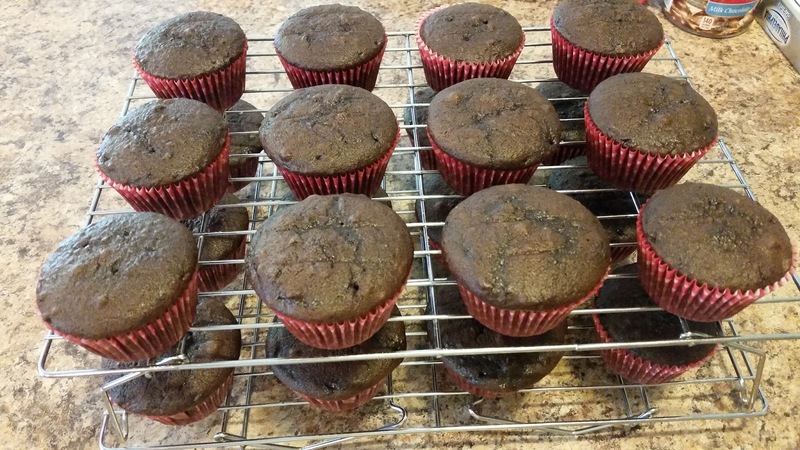 So, I took TWO cooling racks, because I didn't want cupcakes on the loose or all over the floor. 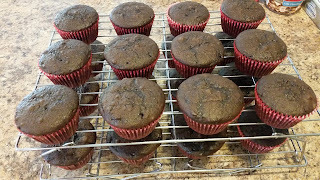 I sandwiched the cupcake pan between 2 cooling racks. This gave me a fairly good sturdy sandwich to build my confidence for the next step. Picture this: right side up cooling rack, cupcake pan, upside down rock. And.... FLIP! 12 upside down cupcakes. Wait, upside down... hmmm... probably not good to leave them like that. So I put the 2nd rack over the top of my cupcake bottoms and flipped again. 12 right side up cupcakes all cute on a cooling rack. No burnt fingers. No loose liners. No torn up cupcakes. If you do this while the cupcakes are hot, there may be a few lines from the rack, but they bounce back and you are going to ice them. Right? Icing is good... don't forget the icing! I was telling my friend about this and she thinks I'm a genius. I do feel like one right now, but I'm sure others out there have done this for years and I'm just late to the game. Now, of course, if you overfill cupcake liners and cupcake is stuck to the pan this isn't going to work as well... so, don't do that. In addition to this trick, next time I'm making 250 cupcakes I'm going to get myself a little gummy finger thimble like bank tellers use to count money. Uh huh... cupcake liners beware. I'm on to your game of never separating correctly. I have plans for you, too. Me and my little gummy finger are out to show you who is boss. They also look super cute sitting on the rack in their perfect cupcake pan spacing.